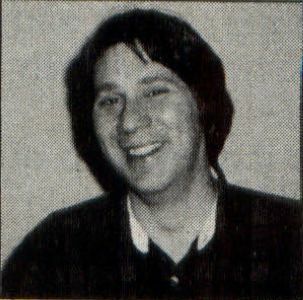 George L. Smyth holds a degree in psychology from West Virginia University and is currently employed as a programmer. He is the author of a series of tutorials on programming in Forth. The program described here is available on this months’ disk version, from the databases of the ST-LOG ST users' group on DELPHI, and from various BBSs and online networks across the U.S.
Last month I completed the task of relocating to a more favorable area. In spite of the fact that the move only consisted of a ten-mile displacement and was facilitated by multiple trips with a rented truck, the inevitable series of misfortunes associated with this chore accompanied my efforts. The most embarrassing of these problems involved the misplacement of the small pieces of paper bearing the names and phone numbers of my friends. As some have unlisted phone numbers, I was not able to contact them until one of the last boxes was opened. Being one to give my computer access to nearly everything, I resolved to enter these scraps of information in an electronic address book. 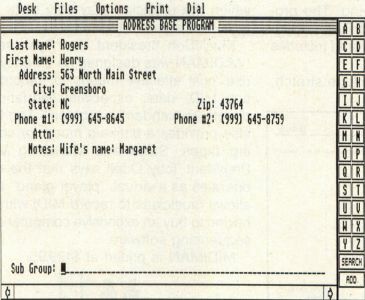 The program I chose, Address Base 0.9 by Steve MacMillan, provides all the essential elements found in an electronic address book. This medium-resolution program has the ability to load, save and merge files; add, edit and delete records and print the entered information. When the program is invoked from the desktop, a GEM window displays the information and options. The menu bar holds the options Desk, Files, Options, Print and Dial. The letters A-Z are displayed on the right side of the screen, with two options labeled SEARCH and ADD below them. A record is added to the file by either choosing the Add Record line in the Options portion of the menu bar or by pressing the control key and the letter "A". This places the cursor in the first field of the entry screen, which includes prompts for Last Name, First Name, Address, City, State, Zip, Phone #1, Phone #2, Attn, Notes and Subgroup entries. When editing, the Up and Down arrow keys move the cursor from one field to another, as the Right and Left arrow keys move the cursor from one character to the next. Pressing the undo key clears the line and places the cursor in the first position of the field. Choosing the Add Record selection or pressing the control key and the letter "A" adds the record and returns control to the mouse. A record is edited by displaying the record and choosing the Edit Record option from the menu bar or by pressing Control-E. Another method is to simply click on the field to be edited. After modification, pressing Control-A updates the record. Deleting a record is performed much like the above: choose the Delete Record option from the menu bar or press Control-D after displaying the affected record. The user is given a chance to back out in case the wrong key was pressed. The records may be displayed via a variety of methods. The easiest and fastest way is to enter the "*" character. This function, called Fast Display, leaves the GEM window and displays the current record. The arrow keys are then used to page through the different entries. Pressing the "*" character again returns the user to the GEM window. Within the window, records may be paged by using the scroll bar at the bottom of the screen. Clicking on the arrow portion of the bar moves the records one at a time, while moving the scroll bar allows a jump to any position within the list. Pressing the home key transfers the screen to the first record, while pressing the shift and home keys relocates the pointer to the last record. A letter to the right of the screen may also be clicked. This action displays the first record, with the last name beginning with the chosen letter. I found this method to be the quickest way to find a name. The Search option scans the address base for an entered non-case-sensitive string within a chosen field. As the Notes field has room for ten lines of entry, the Search feature can even have, to a small extent, database implications, as this field is available to selection criteria. When the search process is complete, the first record found is displayed, with subsequent choices available by pressing Control-N. This search list can be printed or saved to disk as a separate file. The Print option on the menu bar allows three choices: print all, print one and print search. If the "Phone #Only" switch is set, only the names and numbers will be printed. If this switch has not been activated, the printout is not formatted and merely dumps the information to the printer "as is." Existing files may be merged into the file in memory by choosing the Merge option within the Files section of the menu bar. As long as the combined number of records does not exceed the maximum of 400, the files are combined and sorted. Loading and saving information is accomplished through GEM file selectors. The Files menu bar option also allows the user to alter the pathname of the saved files. I hope I won't have to move again, but if I do, I will merely have to locate one disk to get my address book, as opposed to finding several dozen small pieces of paper.